Freedom Rockz: Flyaway to see Miranda Lambert live + much more Free! Flyaway to see Miranda Lambert live + much more Free! 1st Place Grand prize: - Flyaway trip, complete with tickets and meet & greet passes to a Miranda Lambert show for the winner and a guest - Includes airfare and hotel accommodations - Signed print of Platinum album cover ***Grand Prize Winner must be eighteen (18) years of age or older. 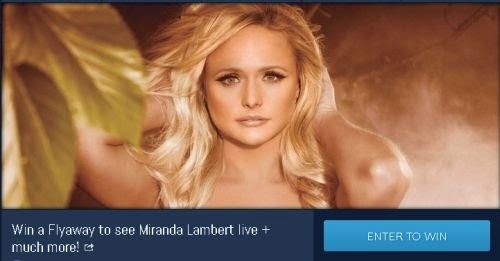 Click the link below to go to the Tunespeak -Miranda Lambert site to enter to win. Once you are on the website click on the blue "Enter to win" button on the right hand side.